Uh-oh! I hear a familiar noise. A trickling sound demanded his attention. Well, I’d better get started. I can’t let the dam fall apart! 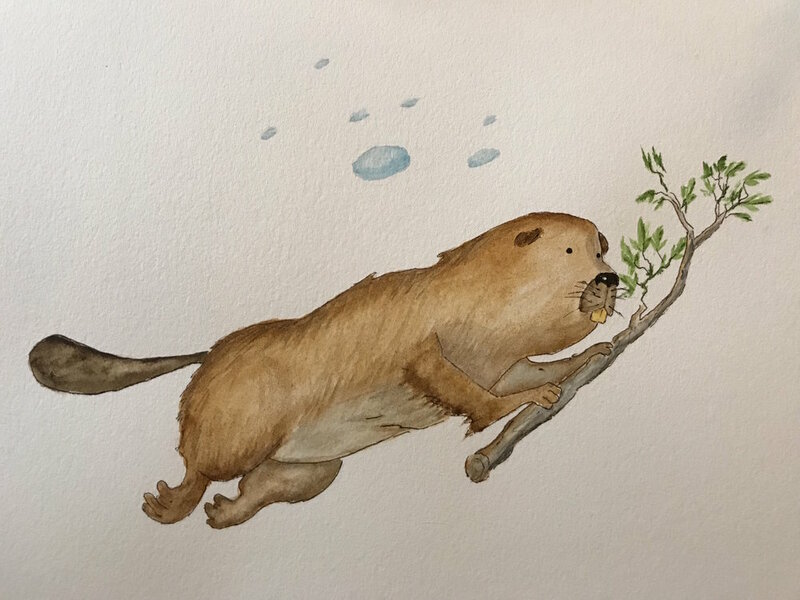 The beaver gnawed down a nearby sapling with his big front teeth and dragged the small tree to the bank. He eased it into the pond. Then, he pulled it in with him. He swam around it and shoved it from behind. It was much easier to move logs in water! At the dam, he used his strength and weight to push the large branch underwater to block the leak. There, he tucked one end under an existing log. He forced the other end down and anchored it with a large stone before dredging up mud and grasses from the bottom of the pond to fill the smaller holes. Not only did the mud slow the water’s escape from the pond, but digging for it made the pond even deeper! That will hold it. I wish another beaver would come along! CRASH! SPLASH! What was that? Nibbler investigated. A large tree branch had fallen in front of one of his underwater entrances! How did that happen? Now I have to clear that blockage. Ugh! More work. At least it’s a nice summer night for it. The lodge was his home. His parents had built it and he had grown up here. Someday, he hoped to raise his own family here too. It was a safe haven that protected them from their greatest fear: wolves. He dove deep and moved the log out of the way. While he was underwater, he saw a strange animal nearby! It swam, played, and fished. Nibbler had never seen one quite like it before. Submerging for minutes at a time, it surfaced again, with a fat fish to eat. That creature is probably the one who knocked a hole in the dam and bumped this log off the lodge! I can’t let that happen again. Oooh, I’m so angry. What should I do?